When we responded to Hackney Council’s cultural and community programme tender, we wanted to propose something a little different. 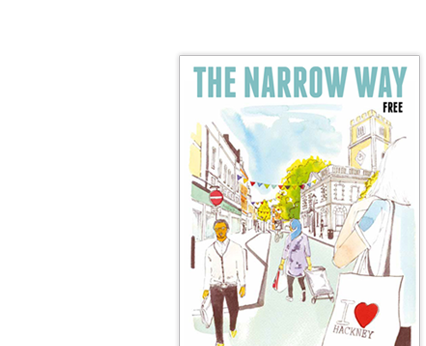 Rather than a corporate-looking document, we proposed a 24-page mini newspaper-style magazine to celebrate the Hackney Central area and all who live and work there. 15,000 copies were printed and distributed to local shops, cafes, pubs and community centres to encourage visitors to the area in a lively, eye-catching and creative way, with the goal of appealing to as diverse a range of readers as possible. As an Olympic host borough and a centre for major regeneration, Hackney has seen significant growth recently, and the council is currently supporting businesses and local residents to operate more easily, and to invest in the borough. Hackney Council was looking for an engaging way to communicate these regeneration projects to the local residents and businesses. We pitched the idea of a mini newspaper-style magazine, which could be fun, and something that the residents might keep. Being Hackney residents ourselves, the uniqueness of the project, and the opportunity to support the development of one of London’s boroughs, was very appealing to us. Production of the newspaper started with a style guide and initial content skeleton, which we presented to Hackney Council, and agreed a plan of action. We commissioned local writers, illustrators and photographers to produce bespoke content, while we also produced an illustrated map of Hackney, which filled the whole centrefold. The newspaper includes features and interviews with local sources, exploring the history and faces behind Hackney. We even hit the streets and conducted some 'vox pop' interviews ourselves! The magazine design that we developed for Hackney Council was a modern, typographic layout, drawing upon 'newspaper' grid structure. We used bright, contemporary colours, which would stand out on the uncoated paper stock. The newspaper was commissioned, designed, printed and distributed within an extremely tight deadline. Turnaround from kick-off to delivery was just 3 weeks. Part of the production involved sourcing the best value print quotes and liaising directly with the printers. Due to the nature of the paper stock, there were specific print requirements, which we worked through directly with the printer in order to achieve the best print results. To round everything off, we also organised distribution of 15,000 copies within the Hackney area.